This is a story about closets, and how messy they can get when you spend a year caring for a baby and put things away so haphazardly that one day, they won’t close at all and you beg your in-laws to watch the baby for a few hours so you can go to a bar get some sleep clean out your closets. Yep, things can get that bad. But if I hadn’t cleaned out this closet, I wouldn’t have snuck off to the bedroom for a while with an old issue of Gourmet I discovered in a totebag, the French Bistro one, and found a chicken recipe I couldn’t believe I hadn’t made yet. That I had to make immediately. So it’s not just a story about closets, phew. It’s also a story about butchering, and I do mean in the wow-you-really-butchered that sense, in that one of my goals in the kitchen has been to learn how to take apart a whole chicken. There are so many reasons I want to be able to do this: it saves money, it makes us more self-sufficient in the kitchen and it’s easier to buy clean and local chickens, which are mostly sold whole. And it’s efficient: my husband likes white meat, I like dark meat, the Muppet ain’t picky and we all agree that chicken stock made from the backs and etceteras of whole chickens (I keep them in the freezer until I’ve amassed enough for stock) is superior in every way. Look how far that little bird goes! So, with the guidance of another Gourmet production, this video from Ian Knauer (who brought us these, by the way), this was my first effort. Which explains why it looks so butchered. Hey, it only gets better from here, promise. Mostly, though, this is a story about our new favorite chicken dish. From the day I first made it, we couldn’t wait to eat it again and it’s gone on repeat in our kitchen more times than any other dish I’ve shared with you. With only a handful of ingredients that you probably already have around, it’s so simply and it’s done in under an hour. The sauce is like nothing else; so fierce and bright, I found it so difficult to not pour over the entire plate — full of tiny roasted Yukon gold potatoes and al dente green beans with flaky salt that you can cook at the same time as the chicken — that I stopped fighting it. And since you had to open a bottle of white wine to make the chicken, you get to drink that too and feel like you’re in a bistro in a faraway land, even if you’re stuck at home on a Wednesday night, trying to chew quietly enough that the baby won’t wake up and try to join the party. The sauce is on the thin side but can be thickened up by reducing the sauce over high heat for several minutes. This concentrates the flavors as well, and if you haven’t used a low-sodium broth, you might find the results a little salty. Just a word of warning. Preheat oven to 450°F with a rack in middle. Pat chicken dry and season generously with salt and freshly ground black pepper. Heat oil in an ovenproof 12-inch heavy skillet (if you’ve got a cast iron skillet, it is great here) over medium-high heat until it shimmers. Working in 2 batches, brown chicken, skin side down first and turning once, about 5 minutes per batch. I like to take a lot of care in this step, not moving the chicken until the skin releases itself and has a nice bronze on it, which will provide the best flavor. Return all chicken, skin side up, to skillet and roast in oven until just cooked through, 15 to 20 minutes. Transfer chicken to a platter, then add shallots, wine, and broth to pan juices in skillet and boil, scraping up any brown bits, until reduced by half, 2 to 3 minutes. Add cream and boil until slightly thickened, about 1 minute. To thicken the sauce further, turn the heat to high and boil it until it reduces to a consistency you prefer. Strain sauce through a sieve into a bowl, if you’re feeling fancy (I never am, but if you don’t, you might find some chicken bits scraped up from the pan in your sauce. We don’t mind.) Whisk in mustard, chives, and salt and pepper to taste. Serve chicken with sauce. Looks great. We always had honey dijon chicken as a kid. Its still one of my all time favorites. Whenever I visit my dads home I still love it! I love this chicken and the dijon sauce looks yummy! Well, I know what’s for dinner this weekend! I’ve just recently convinced my husband to love Dijon…I think this dish could be a huge winner for both of us! Oh, I’m making this one very soon. I love a simple dish that tastes like it took an effort. With such high marks from someone who’s every recipe blows my skirt up, it must be amazing!! What do you think about substituting whole milk yogurt for heavy cream? I love cleaning out my closets. I’m an anti-hoarder in that I send everything I haven’t used in a little while to Good Will! This chicken dish sounds fabulous too, I love that you used the whole chicken. I even have all of those ingredients in my pantry! Dijon and white wine, yum! We’ll have to try something like this, only with boneless chicken since I’m a little … chicken. Thanks for a great suggestion! This will be perfect for tonight! We just got another few inches of snow and comfort food is a great antidote. Oh, yum. Do you think the sauce needs the whole amount of cream? I also just started butchering my own chickens – it gets easier! Try the Portugese chicken in the new Bon Apetit – yum! I love being able to make a nice meal with only basic ingredients that are typcially lying around the house or in our pantry. This looks SO delicious and so easy too! Does the sauce taste like mustard, or does the mustard provide more of a ‘hmm what is that, it’s good’ flavor to the dish? My husband turns his nose up at anything mustardy, so that would be the only difficulty for preparing this dish at home for me. 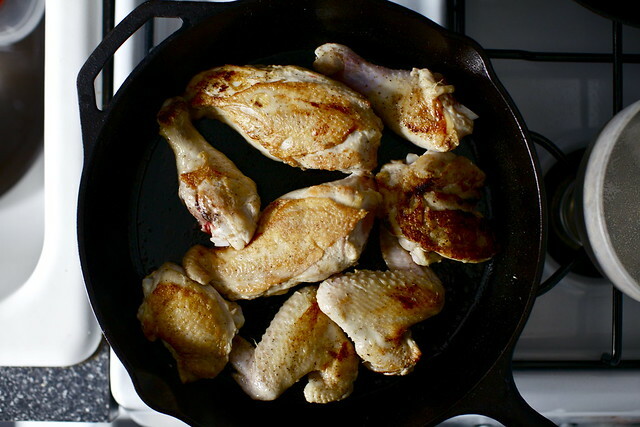 Making roast chicken in my cast iron skillet is absolutely my favorite way to do it now. Thomas Keller’s roast chicken in Ad Hoc is my stand-by recipe. His method of drying the chicken uncovered in the fridge for several hours gives the most delicious crispy skin. I’m thinking that a mixture of your recipe plus Keller’s skin-crisping technique might be a good way to go. I am glad I’m not the only one who seems lost when it comes to cutting up a chicken. I’m going to have to check out that video. Your chicken dish looks amazing. I love stumbling across dishes that you simply can’t wait to eat again! That feeling of “mmm-ing” your way through mouthful after mouthful…such a successful feeling! Once again, I’m amazed at how the simplicity of the right ingredients can make such a memorable dish…this will definitely get a run in our household! Does anyone have a suggestion for replacing the heavy cream? For those of us who keep kosher? It sounds amazing! Yum! This looks so delicious! Oh! I’ve surely never cooked a whole chicken before either and don’t know the first thing about butchering anything. But I’ve been intrigued by it for awhile and maybe I can get up the gumption to do it soon. The sauce sounds ridiculously good! Is that on the regular bake setting or the convectional roast setting? I’m still trying to master the art of roasting a chicken. I just made Cornish hens on Monday which made me remember how delicious roast chicken is! I seriously need me one of those “spatter-guards.” Yep, this will make the menu this weekend sometime. I just had say…wow that video about cutting the chicken was really helpful…I thought I knew how to do it, but his tips and tricks make it look soooo much easier! Thanks for that link…Oh and I plan on making this recipe very soon…thanks for that too! It’s a dish like this that makes me want to put an immediate stop to being vegetarian! Good thing I have a family that absolute loves any roasted chicken PLUS dijon…you’ve got them drooling, and they haven’t even heard what’s for dinner tonight…as for me, another one of your amazing and tried and true veggie options will be more than sufficient, and ummm…so will that white wine. Deb-A recipe in the current of Cook’s Country cooks the chicken this way but adding stock to the roasting pan after the browning. I made it this week and it worked nicely, crispy on top and moist underneath. Wish I had had the dijon sauce to go with…. Do you have poultry shears? They make butchering your own chciken much easier. I often use them to cut up a whole roasted chicken as well, it is not the prettiest method but very helpful when my children are complaining they will pass out from hunger. I just found 2 local pasture raised chickens I forgot about in my freezer. Thanks for deciding for me what I will do with one of them. i know it’s past lunch time and I just had a pear to eat, but after looking at these images I’M STARVING AND WANT TO SINK MY TEETH INTO THESE CHICKEN LEGS! Hi all, any suggestions on a type of white wine to use for a non wine drinker? I just don’t know what kind to buy! This looks like the perfect cozy dish to make on a snow day like today! I’m glad to know that I’m not the only one who feels a little bit adrift when it comes to butchering a whole chicken, even though I may have a lot of confidence in the kitchen otherwise. Thanks for sharing! Wine — Something inexpensive and dry. I do not cook with fancy wines, no matter what those people on TV (who clearly are not buying their own wine) always suggest. I sometimes find $6 to $7 bottles that are surprisingly decent, and keep them around for cooking. If you want to drink wine that night, no reason not to use some from the bottle you have open. Jen — I only have one setting on my oven, and it’s not a convection, so I’d say bake. Yum, yum, yum, all the way to my belly! This looks so delicious!! Roast chicken for a weeknight, yippee! I find the ‘butchering’ thing pretty daunting especially since I don’t have good knives so I usually erm, chicken out (sorry! ), and ask my butcher to cut things up for me. Question is: what to do with the leftover cream? What is it about the words “brown bits” that make my mouth water? Any advice on how to make this kosher? Just leave out the cream? Just leave it out? It’s the same in our house, I prefer the dark, the husband prefers the white. I’ve never attempted to cut up a whole chicken but this recipe might tempt me to. As for our closet, I don’t even want to start. Chicken and Dijon has been a favorite go to dish for years. I usually only roast on high heat, but browning the chicken in the pan first looks too delicious to pass up. On cutting up your own chicken, after you have done it a couple of times, it is a cinch and I too love the left over parts for stock. This sounds so flavorful! Dijon is one thing I love to cook with. I’ll be trying this one soon! In addition to what JF said (no 31), many supermarkets now carry soy, coconut, and almond-based creamers which you find near dairy-based cream and milk section. They have the same consistency as half & half and make a fine substitute for heavy cream. Personally, I think the coconut based creamers add the best mouth feel and tempers the dijon or other sharp flavors the best. yum! this is definitely going on the menu one night soon! This is happening for dinner. Thank you! Way better than cleaning out my closet which is in the same state of disarray…..
Looks yummy, and I’m a sucker for anything with dijon! The first time I butchered a chicken, which was really just removing the rib section from the breasts, I was so horrified at the blood, sharp bones and feel of raw meat I almost went vegetarian. But now that I’ve had a little more kitchen experience, I find too that I am wanting to learn more about meat in general — how to dismantle a chicken, differences between cuts of meat, etc. Always looking for a new chicken recipe and this looks fantastic! My husband would love it, too. I’m a recent convert to Dijon mustard and this looks like a great recipe! Working with whole chickens really is so very satisfying. True story: I include cooking Bistro Style food on my resume. This is exactly what mean when I say that! I love when you make recipes from food magazines. It makes me go through my stack and test things too. It helps to justify the million subscriptions. This chicken looks perfect! This is EXACTLY the type of recipe I love!! Lucky for me, our butcher has local chickens all nicely cut up, but it would behoove me to learn the art of butchering (if for no other reason than I get to say I have done it :). Old magazines have a tendency to sneak back in our lives somehow– the same distraction happens to me every year when I have to hoe out my cookbook collection! I will definitely make this, and the Booze Hound will love it! Deb – this recipe looks wonderful. I was really hoping you could do a step by step photo tutorial for cutting up the whole chicken into parts. Like you, I am a former vegetarian who now occasionally enjoys the dark meat while my partner enjoys the breast. For me, the chicken is challenging – the Joy of Cooking illustrations don’t prepare me for cutting up something that used to be alive (!!!). Perhaps in the next chicken recipe? Pretty please? My first reaction to this post “I’m not the only one?!?!? !” I’ve been cooking for years and never conquered this until this weekend when I roasted my first chicken. Then the next day I made a little chicken stock and turned some of the leftovers into soup. It’s so funny to me that things my mother and grandmother would consider the basics are stuff that we’ve all put off trying. Ok, say I don’t have an oven-proof skillet, is there a way around that? I’ve seen this in other recipes, but haven’t gotten a cast-iron skillet yet. Can I make this first on the stove in a normal pan and then transfer to a (glass) baking dish? I don’t see why not, though maybe I need to pre-heat the glass baking dish first? Looks like a delicious way to make chicken! Anna — Yeah, glass or ceramic or casserole. Just make sure it can go up to 450. Ha, funny – Andrew prefers white meat too, and I’m a dark meat girl. Everyone wins with the whole chicken. This looks perfect, I’ll make it this weekend. It really is amazing how much more cost-effective it can be to butcher your own chicken instead of buying cut-up parts. Often, a whole chicken costs as much as a couple of boneless skinless breasts. When you can bone and skin those chicken breasts by yourself, plus have the rest of the chicken too, it’s a real boon! I learned to cut a chicken into eight pieces when I was 11 years old, standing over the butcher block with the Fannie Farmer Cookbook by my side. Hi, recipe looks great but I’m wondering what a non-dairy substitute is for the cream!? Thanks! I stopped trying to clean my closets when I looked inside and found kids in there. Maybe once they are all big enough to not be able to hide in the closets anymore I’ll try again. As for the chicken, I remember reading this and thinking I should make it. I don’t know why I haven’t. I have cooked both boneless chicken breasts and boneless pork chops in a very similar sauce. Very easy and quick, good for a weeknight after school activities get us home late. Brown the meat first, set aside, and make the sauce in the same pan, reducing it a bit. Then add the meat back to the pan to rewarm and soak up some of the sauce. Gives flavor to bland cutlets. I’m buying whole chickens from a local farm as well and having to abandon some chicken recipes less accommodating to whole chickens – thanks for this! mmm…this looks amazing. also, your kid is the cutest! Looks and sounds delicious… I will be trying this! :) Thanks for the recipe! Kudos to you for tackling a whole chicken! My dad taught me how to cut up a chicken when I was a teenager. You can buy a whole chicken to roast and then decide you want to make something else — so many options. And you save money and gain chicken stock, too. You’ve empowered many to take the chicken by the tail and cut it up! This looks great! The moment I saw it I longed for it! For some strange reason I want to put green peppercorns in the sauce. Gonna do that for sure! For those who don’t keep wine in the house but want to cook with it, you can buy little four-packs of small, one-to-two serving bottles of wine, at least at my grocery stores. I pick a generally good red and a white I like, and keep them in the fridge for use in cooking. Saves opening a whole bottle of your favorite just for a bit in a sauce. Yes, please. Thanks for sharing! I have a mental block and can’t handle raw chicken (I know, I’m weird) but I would definitely eat this if someone made it for me! Looks great! A clean closet *and* Dijon chicken? Heavens! Wow, beautiful! And ironic too, since I was hankering for a mustard sauce to go over chicken the other day, and this one sounds absolutely perfect! Will definitely be trying it out this weekend. We’ve been planning to roast a chicken since our oven comes with a rotisserie spit and we haven’t tried it out yet. This looks fancy but we’re just gonna make something very simple and yes I have no clue how to cut chicken. Thoughts on whether it’s worth making without cream/dairy? I think my parents will love me just a tad more when I make this for them for dinner. Naturally, I’ll bring over a jar of your chocolate-peanut spread, that is if I can keep my fingers out of the jar.. Recipe for the potatoes and green beans? I’m glad you found a chicken recipe that you like well enough that it’s worth repeating, that alone sell me on this one. Unless I’m making a chicken wing appetizer, I only ever buy whole chickens, especially when they are on sale. They are the best value for the $$$ that it’s so worth learning to cut them up. Some stores will do it for you for a nominal fee..or even free if your butcher is not too busy. If I have a whole chicken to roast, I will usually roast two and package up the cooked meat for other uses later then brown and boil up the carcasses and extra parts for stock. Such a time saver and it is just too easy to do two of them as one. And…The breast meat on the bone is nothing like those pale, tasteless cutlets that are so convenient. For those of you who keep kosher, use any non-dairy creamer. It just won’t be as thick as using heavy cream so you may have to keep cooking it down to get the desired consistency. The Frog/Commissary Cookbook (from the late, much-loved restaurants in Philadelphia) has a wonderful recipe that calls for browned boneless skinless chicken breasts with an amazing sauce made from apple cider, cream and Dijon mustard. It’s the traditional Christmas Eve dinner at my friends’ house (to which this nice Jewish girl is always invited). Are we going to see some amazing recipes posted as you and all New York City are trapped inside for a while? I hope you have a pantry packed with goodies and a safe snow day! Looks amazing. That Dijon sauce sounds incredible. It is pretty much the perfect flavor for the chicken. Good ideas about using the ENTIRE chicken too. The way you write about the benefits of cutting up your own whole chicken almost had me convinced to do it. Then I watched the video (similar ones of which have prompted me to try my hand at it in the past) and quickly remembered how much more of a struggle it is than they ever seem to show. First of all, he clearly has the right knife, a boning knife, plenty sharp, and just flexible enough to get around those thigh sections but sturdy enough to slice through the wing joints too. As I haven’t yet decided if deconstructing my own chicken is something I’d like to do regularly, I haven’t yet invested in such a knife, which in turn makes the whole process more difficult which of course makes me less inclined to want to do it more, even though it would justify the purchase. Also, my chicken always seems so cold, and working with a slippery carcass and a sharp knife with icy to numb fingers is not conducive to such precise cutting. By the time I’m ready to pull out that breast bone, it actually hurts to work my fingers under there and lever it out. All the while, my face is contorted into a grimace from a combination of the concentration, the painfully cold fingers, and the slimy dead bird I’m mangling beyond recognition. And when I’m done, I have to try to turn on the faucet with the upper part of my lower arm, which is impossible, as my current apartment faucet handles are the absolute worst design for a kitchen sink ever, ever, ever. And then my good intentions of keeping the backbone for stock is hit by the reality of the fact that my freezer is already chock full, and when I finally do find a space for that freezer bag, it’s only to be forgotten behind the other contents until, months later, it emerges, a lone, clump of frostbitten chicken back reminding me of my failed venture into the world of cutting up my own whole chicken. I know, I’m worthless. I still want to make that Dijon Chicken, though. I’m also wondering if this sauce could be adapted for steak, as I had an acquaintance who once served such a dish, and I’ve ever since regretted not asking how he made it. Looks incredible, Deb. Any suggestions for applying the recipe to tofu? Holy moly! I am now starving! We will definitely be making this for a Thursday Night Dinner! this sounds delicious. will have to try it. thanks for sharing! I really need to learn how to cut up a chicken. Thanks for posting this! mmmm…roast chicken…my favorite! I should mention though i that I will probably eat all of the roasted chicken skin as I make the sauce and then sauce the naked birds. It’s what I do to roast chicken-gorge on crispy chicken skin. oh my. Yes! My husband loves mustard of all kinds (at one point we had a dozen different kinds) so any recipe that combines mustard for him and heavy cream for me is going to work out just fine. I won’t be butchering my own chicken, though. I love seasoning chicken with mustard – you might also like to try adding some freshly grated cinnamon to the chicken when you’re browning or roasting it. That might sound weird, but the cinnamon goes SUPER well with the dijon mustard. OH MY what a great and quick dish, i love those. I buy a full chicken every sunday and make stock every sunday. Now i know what else i am doing with my chicken. Thanks! Hi! I haven’t made it yet, but this recipe is exactly what I needed. I’m an American girl living in Italy and I’ve been gifted two whole chickens cut in half. I have been looking for what to do with them, but most of the American recipes I’ve found are for “boneless skinless chicken breasts.” What if you want to make REAL chicken, not chicken-like products? I made something like this the other day and my boyfriend went nuts over it! I’m glad to compare your version… mine didn’t have shallots, but what a great addition! …and so I trek out in the newly fallen snow for a chicken. Isn’t it glorious to know how to cut one up? I studied in France as a college student, and I remember my friend there making something along these lines in Paris and again when she came to visit us in CA. It was very tasty then, so I’m looking forward to trying yours. My favorite economical “go-to” is a whole chicken. We roast it, then make tacos and/or chicken soup out of it. My favorite chicken soup from it is a coconut milk/lime/Thai curry style. My mother grew up on a farm in the Great Depression. I will never forget how quickly she could turn a whole chicken into parts, mindlessly. I remember saying something about it once, what a skill it was, and she just looked at me and said she also knew exactly how to get it from a live animal to whole chicken ready to be made into parts. I was about eight at the time and found this quite shocking to consider, but as one of the eldest of seven kids, she had a lot of responsibility. When I first saw the picture, i thought the scallions were baby peas (I know, I know; you’ve told us you’re not a fan of peas. I, on the other hand, could eat them raw, frozen, or off the floor. Though I try to be more civilized.) So next week when I get around to making this, I’m throwing some peas into the sauce. My husband can cry all he wants. It will be delicious! Thank you for providing the link to the video on cutting a whole chicken!! I tried it once, without any guidelines, and ended up using three different knives and making a big slimy mess. Now I know…if you want the breasts for something, you’ve got to cut everything else off first. Ohhhhhhhhhhhhhh. Now I feel empowered to try again! Because I just haven’t tried it. It’s entirely possible other things will work but nothing really thickens a sauce like cream and with a sourish cream like sour cream, yogurt or buttermilk, you risk curdling. I’m not a fan of boneless skinless meat; I’d rather cook meat intact and pull the skin off if I want it to be less fatty because it stays more moist that way. Since these questions have been asked a few times, it would be great if anyone tries this in a way that varies from the recipe that they report back and tell us how it went and if they adjusted cooking times. Hope that helps! #36 Tamsin, what CAN’T you do with leftover cream? ;-) First, you can have the most luxurious cup of coffee ever. Several of them, in fact: a little cream goes a long way in coffee, and can make even so-so coffee taste pretty good. Also, you can make hot cocoa with it — heat the cream a bit, whisk in cocoa, a bit of sugar, and a dash of salt (and maybe vanilla and cayenne, if that’s your bag), then heat to steaming. (Cut it with milk or water if it’s too rich.) That’s just a start, though; use cream in many baking recipes where milk is called for, like cakes, biscuits (Deb’s got a cream biscuit recipe that’s so simple it’ll blow your mind), and scones. It can also make simple frostings and icings a little more tasty and thick, as fat carries and accentuates other flavors. On the savory side, make dips with it: beat up cream cheese and thin it with cream, or whisk it with sour cream, yogurt, and/or mayo. And pan sauces, as you can see from this recipe, are a big one. I haven’t tried it yet, but I know that curry pastes plus cream make tasty pan sauces with a minimum of effort and a maximum reward. It’s good in cornbread, too, where you might use milk instead. There are other savory uses for cream, but I tend to see the sweet/baked ones first. Deb, we made a very similar sauce recently with our own homemade grainy stout mustard (from an old Saveur recipe), and it was terrific. It was kind of thrilling, too, to know that we could make such a drop-dead-good pan sauce without a recipe. And good on you for demystifying chicken cuttin’-up! The boys in my house saw this before me – I am now being ordered to make this for dinner tonight. You may have just turned a non-meat eater (I hate the term vegan) into a meat eater. Can I substitute buttermilk for heavy cream? I really want to try this recipe tomorrow, and I’m just about ready to go down to the grocery to procure the food stuffs, but knowing that I have about a cup of buttermilk left that may go to waste if not used, makes me loathe to buy heavy cream! Please advise! Thanks! Looks fantastic! Dijon and chicken were made for each other. How funny! We’ve decided to learn to butcher whole chickens this year too since I can only get whole ones at the farmer’s market. I’m also obsessive about not wasting and have gallon ziplock bags in the freezer to collect bits for making stock. I’m quite positive our kitchens are the exact same. My stove/oven is also practically in my sink too! Your counters are much nicer, though. This looks amazing. I would really like to butcher my own chicken too – haven’t quite worked up the courage yet, but your right it is so much more self sufficient and saves money. And i can use whatever cut i like off a delicious tasting free range chicken. Also my husband and i also like white versus brown! I can also relate to closests (not a word i normally use!) – i have a 5 month old…. This looks great, Deb! Can you explain what you mean by letting the chicken skin “release itself”? Andi — This is one of these concepts that I’ve been meaning for a long time to get into words that make sense, and generally fail. It goes like this: everything I know about cooking meat comes down to this concept of “glue” that was introduced to me when I took a barbecue class a few years ago. As they explained it, proteins are like glue. When you heat them up, they drip down and adhere to whatever surface they’re on; we pretty much know this from every time something gets stuck in a pan. But if you give them enough time to cook, the “glue” dries and they come off quite easily. If you fight it off too soon, you don’t get good color/a good seal on them and you lose chunks of your steak/burger/etc. This definitely follows for skin-on chicken where when you first put it down, it sticks and sticks but if you give it enough time to cook, it will be easy to remove with just a little nudge you’ll have the kind of underside that you see right-side-up in the 4th photo. In that photo, I’m browning the meat. I.e. Preheat your pan, preheat your oil, but then leave the chicken alone and trust that it will release easily when it’s nice and browned. Hope that helped. Not to mention, butchering your own chicken will make you feel like a cave woman, which is nice. Don’t worry– cutting up chickens gets a LOT easier, very quickly, and yours already looks wonderful. When I got married three years ago, I had never even seen a dead chicken that hadn’t been reduced to its constituent parts. Three months later, after cutting up one a week, I could get the chicken from the grocery sack to an array of Ziplocs in the freezer in about five minutes flat. It’s much, much easier if you take the wishbone out first. This recipe is more important to my household than is cold cereal, and works with just about every variation imaginable by humankind. Once I reached into my fridge door for the Dijon squeeze bottle, got the hoisin sauce instead, and didn’t realize it until I started making the sauce– and my picky, food-distrusting husband cleaned his plate. You absolutely can’t go wrong with it. Deb, could you pul-eease, pul-eease, clean my closets? I’d be happy to take care of the world’s cutest Muppet — and Elmo too. Love this method of cooking chicken. Love, love those cute little baby Yukon Golds. I boil them until done, drain. Then put some butter and oil in my trusty cast iron pan, let them roll around a little in the butter/oil. Then I get out my potato masher and SMASH each tiny potato individually. Let them sit (don’t move) until crusty and GBD (golden brown and delicious). Salt, pepper, sour cream, eat. Roll around in ecstasy. 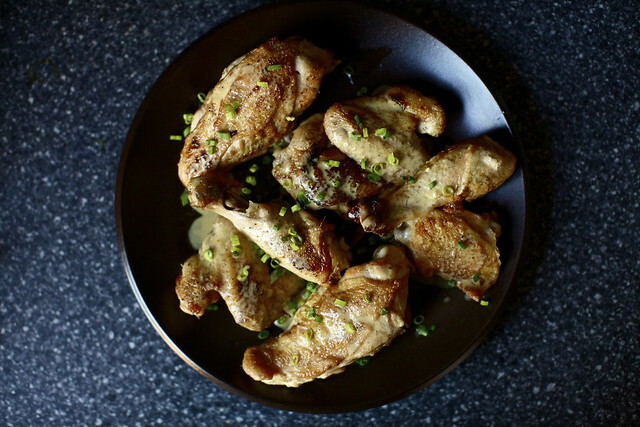 Have you tried Amanda Hesser’s Lemon Chicken. * Easy-peasy, exactly like this recipe just different sauce. Creme fraiche, lemon. Need I say more? *Just google. I can’t do links. Help! It’s on “The Wednesday Chief’s” website. that looks fantastic i love dijon chicken – definitely going in my recipe-asap folder. thanks! That’s awesome, Tamsin. Don’t be afraid of cream, because once you start playing around with it, you’ll start seeing all kinds of uses for it. Finally, I forgot one of my most favorite uses for it: caramel. Caramel sauce or candies — you simply cannot go wrong. In fact, I have the better part of a quart (!) of my riff on Deb’s salted butter caramel sauce in the fridge. Why a quart? I had a lot of cream to use up, and because I planned on using it as part of a DIY dessert bar for guests in July. The planned event was called off, and so it stayed in the fridge. I hadn’t thought about it much until last week, when we popped it open to dollop on cinnamon rolls. The caramel sauce is thick and creamy and still tastes delicious. So, consider that option, too, when you have a surfeit of cream — caramel is a great way to preserve and embellish it! That issue is my absolute favorite – I’ve made that chicken dish many a time. Lurv it! The dijon sauce sounds delightful! I had to laugh about you chewing quietly so you don’t wake the baby! Yum! Nigel Slater has a really similar recipe for pork chops with mustard suace in The Kitchen Diraries I’ve made a couple times. His calls for chopped cornichons too, which fits it with the French bistro theme. Looks delicious!! Hooray for recipes that call for Dijon mustard! It’s the unsung hero in my fridge. I don’t use it often, but when I do, it makes me look goooood. I often make this. I learned from an American lady while I was in France. But I usually use butter instead of oil and sometimes I add some garlic to roast with the chicken and put that in the sauce too. ‘Tis the yum, it sure is. I have tried variations without cream due to poor grocery planning. The yogurt would be awful, I think, don’t do that! But if you are really not wanting to use cream I suggest doing a kind of bechemel, at the end of cooking the shallots add some flour (not a ton, but maybe a heaping teaspoon) and let it cook a bit, then mix in the wine and some milk gradually instead of the cream. The flour will keep the right texture without the fat of the cream. I prefer cream, but if you must be puritanical (or absentmindedly forget to get cream at the grocery store) it will work. Fat free sour cream (ugh, I can’t abide it, but I know others feel differently) would also be a good sub for the cream if you are going low fat, I’ve used full fat sour cream with a little less mustard (and with the addition of blackberry jam, for a sauce for pork done in a similar way) and its great (just let the pan cool a bit, and add less wine = less risk of curdling). Deb- I love your recipes. If you would do a post on making stock it would make my day. I know its supposed to be simple, but dang if my stock always tastes… off. Burnt, or for lack of a better term, muddy. I don’t know what I’m doing wrong, I skim, I let it simmer for a long time. Its bugging me. Ack, I’m dumb. I just noticed you linked to a stock tutorial in the post. I’m going to give your instructions a go as soon as I have enough chicken bits. Thanks! This has to be a personal record… read this recipe at noon, and made it for dinner seven hours later! I used a single bone-in, skin-on chicken breast (perfectly cooked after 17 minutes, and I mean perfectly!) and for the sauce I kept 2 shallots, but halved the rest of the liquids. Didn’t have a cast iron, but my stainless steel calphalon worked great. I love what you pointed about about the skin “releasing” itself. There was no sticking at all! Next time I’ll brown the shallots before adding the liquid and boil it all down EVEN more. I paired it with NYT’s recipe for cinnamon roasted potatoes. A-MAZING! I can’t wait to make this again. Thanks so much for sharing! Ps. If people are looking for heavy cream subs, use creme fraiche. It’d be even French-ier, but I guess it help with the fat quotient. Just the thing for this snowy night. I never want my chicken any other way! Thanks for posting. Ah, it somehow makes me feel a lot better that I’m not the only one who didn’t know how to cleanly cut up a chicken. I always wimp out and just roast the thing whole (which obviously is delicious), but this seems like a skill that would be really beneficial to have. Thanks for pulling this all together and encouraging me to get intimate with my whole chicken. The only words that could come out of my mouth while eating this chicken are not found in your standard dictionary…mumbles, gurgling, bubbles and kissing noises were the only audible sounds I can remember hearing since the rich flavors of that sauce deafened all my other senses. Used a South African Chenin Blanc, seasoned chicken with my favorite all-purpose Riley’s Cajun seasoning, stirred in a tblsp of butter in the sauce and steamed broccoli seasoned with red pepper flakes, salt and a little toss of butter. Holy cow. Need a cold shower. Thank you. Great tips. I’ve never cut up a whole chicken before either and the video was super helpful. Of course, the recipe sounds delightful too–can’t wait to try this. Deb, I’m printing this out immediately and making it this week. I get chickened-out at times and I’m always looking for new chicekn recipes. For some reason, I never pair chicken with mustard, but this looks delicious. And I love that there are only a few ingredients, all of which I always have on hand. Thanks, once again! Amy and others who keep kosher, does coconut milk retain it’s coconutty flavour once you have added it? I generally skim over articles that contain milk and meat because I have never had an adequate substitute for cream. I made this tonight! It was like the stars aligned today – I needed to cook dinner, this recipe popped up, I had most of the ingredients and could get the rest… And it was fantastic. Rather than cutting up a whole chicken I bought a couple of skin on legs and skin on breasts, but I’ll attack the whole bird next time. I followed the recipe exactly and it was perfect. I only had a chilli-flavored dijon mustard (from a Christmas hamper) but it worked. Oh, and I don’t have a oven-proof skillet, I just used a frypan for the browning and the sauce and transfered the chicken to a metal roasting tray for the oven bit. When removing the chicken to a plate I added the roasting juices to the frypan for the sauce. And I didn’t exercise any brain power when it came to sides, roast potatoes and beans were ideal. So, yeah. Just wanted to say thanks. I love mustard on my chicken and this sounds wonderful. Down with sauce recipes calling for heavy cream. I first witnessed the overuse of heavy cream at the CIA. They sloshed it intomeverything. And I thought it was nuts. How many artery clogging sauce recipes do we need ? Just give me a well cooked roast chicken. NO SAUCE. This has got to be on my to-make list. The photos are gorgeous as always! Thank you so much, first for the recipe which looks fantastic… and secondly for the closet portion of the story. I write this to you at 4:10am with one hand while nursing a baby and you have made my day already. Somehow, knowing that others just cram stuff here or there while trying to get through the day with little ones.. or try desperately to chew quietly enough that you get to have a meal while it’s warm, is very comforting. Makes me feel better to know ‘it’s not just me’! Making this one tonight- thanks again! This looks delicious!!! The Dijon sauce looks and sounds amazing. Thanks for sharing!! Ha! I have that Gourmet magazine issue tucked away too! Thanks for the reminder that it’s in a pile, somewhere in my apartment. Gorgeous and inspiring as always. Any ideas for wine substitute (non-alcohol)? Ooh, I am making this tonight and doubling up on the sauce. This looks delicious. Where I live, chicken comes whole, including the head and feet and all. I pay to have it plucked for me, but I still get to deal with the head and all. Fuuuun. A sharp knife and kitchen shears are key. This was perfect for dinner last night (paired with your cauliflower bean feta salad from a few years ago!). Thanks for helping me to continue cooking throughout the crazy life schedule that is grad school. Can’t wait to try this dish. I love your use of the iron skillet. With a whole kitchen stocked full of All Clad (I worked forWilliams Sonoma) I still go for my iron skillets. When my parents both passed away a couple of years ago I took some of their pieces and now own at least 12 iron skillets, corn bread holders, Dutch ovens etc. You can’t beat an old iron skillet. Hi Deb – This sauce is very similar to one that the Brennan’s (Commander’s Palace) use on pork chops. I have been making it for 10 years and it is amazing! They substitute the brandy for the white wine. If I could pour it over my cereal, I would! Can never have too many chicken recipes, especially with the skin on…love the helpful video…thanks! This sounds and looks amazing. The video was inspirational and I’m running out to get the chicken now. Making this along with roasted fingerling potatoes and haricot vert & shallots as a midday meal this Sunday for a Francophile friend. Can’t wait. Just love, love, love your writing and recipes. Thanks for the recipe, it looks amazing. Just a small comment about something that will drive most scientists crazy: Searing meat does not “seal in the juices”. If you are curious about the chemistry involved in cooking, I recommend reading “On Food and Cooking” by Harold McGee. Even if you are not the dorky kind (and god knows I am) it will dramatically improve the technique of your average home cook. My family loves this recipe and we all agree – we’d eat shoelaces if they had this sauce on it. As to asking about skinless/boneless pieces in the recipe? I have a nonstick electric skillet, a large one (I only have two stove top burners) and I was able to make this with skinless boneless chicken thighs, all in one pan. I kept a close eye on the thighs (cooked them with the lid on) and took them out to rest while I finished up the sauce. I wouldn’t try it with anything other than thighs, I doubt boneless skinless chicken breast pieces would stay moist. Also – I’ve used half and half and creme fraiche rather than heavy cream and the sauce was fabulous. I’ve also subbed in a half coarse grain/half dijon mustard mixture that was wonderfully flavorful. And yes, nonstick – UGH – I know – but I don’t have a freestanding burner to use other pans on when I need the extra space. In an imperfect kitchen, we do what we must! Mustard always seems to make just about everything taste great! I agree with Vera (#77), please share your recipe for Yukon potatoes and green beans. I asked once before and I will ask again, is there some way to make the links in your post stand out more. I noticed that one person missed your link to the chicken broth recipe so I thought I would make my request one more time. Also, is there a way for you to notify your readers when new comments have been added? I roast tiny Yukon golds on an oil-slicked tray at 450. If they’re bigger, I’ll halve them. If they’re not minis, I’ll cut them in thick rounds or chunks. I talk about my roasting technique here, but to quote: “I roast vegetables a little oddly these days. I used to do it the “normal” way, tossing them with oil and then laying them out on a sheet but I always needed more and more oil and the pieces still stuck. Once I started generously oiling the pan, my vegetables started browning really well and didn’t get weighed down — most of the oil stays on the roasting pan.” You can toss them around about 2/3 of the way through, so they cook evenly. I don’t like to move them too much in the first 20 minutes, because I find it takes at least that amount of time to get a nice brown on the underside. I boil green beans for 3 (if they’re haricot vert), 4 or 5 minutes and either shock them in ice water or just drain them and let them cool — if the latter, I’ll take them out a minute sooner since they’ll keep cooking as they cool. We’ve discovered we like them with just flaky salt, so we don’t bother dressing them up. One day I’ll talk about my green bean habit, and how I figured out I’d eaten 1 to 2 pounds a week for three weeks straight. I will need an intervention soon. June123 — I mentioned in an earlier comment (#40) but I really really don’t fuss over wine varieties. All I care is that it is dry, passably drinkable and inexpensive. We’re going to redesign at some point, hopefully soon, and the links will be more easily viewed. I know they’re pale. As for notifications, do you mean like by email or RSS? If you’re interested in following all new comments by email, you can use this feed. And I know this is an overly technical solution that we’ll make easier with a redesign but if you add “/feed” to the URL of any post, you can use that RSS feed to follow new comments on any post. Trader Joe’s sells a kosher, already-cut-up chicken. Re: the heavy Cream issue. I have been making a boneless, skinless version of this for years. Instead of using heavy cream and a long time reducing the sauce, I thicken the sauce with out the heavy cream, then just at the end add a couple of heaping tablespoons full of sour cream. This thickens up nicely without curdling. I am going to try this whole chicken version real soon. Keep up the great work Deb!!! Beautiful first picture! I love roast chicken ahh! @Amy and others seeking kosher or lower fat versions–you can make this without the cream and it’s still lovely, but the sauce will be thinner . Two methods I’ve found to compensate: Method 1: Use at least 1/2 cup more broth or stock, but reduce the sauce longer. Especially if you have good homemade stock rather than canned, it will thicken and be lovely and rich–but make sure it’s low sodium or it will be very salty! OR Method 2 – At the end (after adding the dijon), Use 2 tsp of arrowroot mixed into 1/4 cup cold liquid (either wine or stock, whichaver you have more of). Off the heat, stir it into the sauce and bring to a simmer–sauce will thicken almost immediately. If you keep boiling it will get thin again, so do this right before serving. 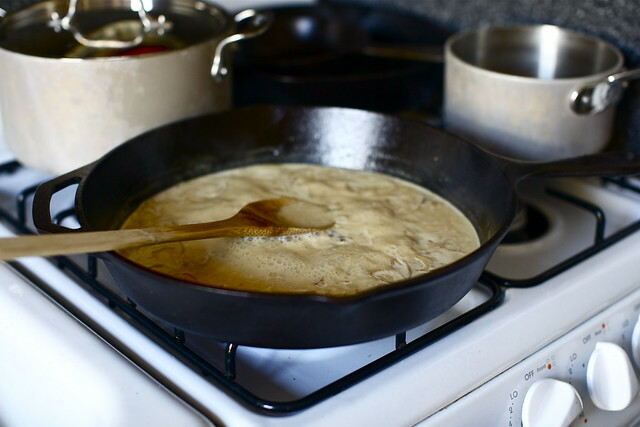 It gives the “mouthfeel” (very unromantic word) of a cream-thickened sauce while avoiding dairy. I made this for my husband last night…he LOVED it. And I loved the wine while I cooked dinner! I’m vegetarian so I have to take his word for it that this is a fabulous dish but I think the fact that he sopped up all the dijon sauce on his plate with bread (and he’s not a bread man) speaks volumes. Deb, your site is the best! I have become addicted to so many recipes I’ve found on here. Can’t WAIT for your cookbook! Love your sit. Love the chicken dish! I too save chick parts for stock in addition to mushroom stems and Parmesan ends. My closets won’t shut and neither will my cupboards and they all have back issues of food magazines in them and I don’t even have a baby! Chicken looks lovely..miss Gourmet so much! This will be dinner on Sunday! That sauce looks and sounds amazing! I don’t know if I’m brave enough to take apart a whole chicken, but I want to make this sauce for the frozen chicken breasts I buy in bulk from Costco. I love cooking with wine, too! I found Smitten Kitchen about a month ago and I’m *hooked*. I love the Surprise Me button and your wonderful index and have made several recipes using up my CSA share, all I will make again. I just happened to have a whole chicken yesterday and had been putting off roasting it whole until I saw the GREAT Gourmet video! I immediately knew what I was going to make for band practice dinner. I made this recipe using a zinfandel orange mustard and half and half instead of heavy cream. To thicken it a little I added a sprinkling of cornstarch to the pan after roasting before adding the liquid and it thickened nicely. The finished product was so good (and beautiful) that I couldn’t resist devouring both wings over the sink before everybody showed up. Next time I will let the chicken dry more before roasting to get a deeper brown color. Love your blog and can’t wait for your cookbook! Yum, thanks for sharing this recipe. I am running out of new ways to cook chicken for my husband. He is a totally chicken man and I usually roast a whole chicken every Friday for him. Also, this post makes me realize how much I need a slatter guard! I know I already posted once today, but you so need to get this for Jacob! I don’t have kids, don’t want kids either. But when I saw this, I immediately thought of him! EEK! too cute! Commenter #69 checking back in. I made this in miniature last night – used only 3 thighs for me and the hubby, but the entire sauce recipe. I added a handful of green peppercorns while the cream reduced, otherwise no changes to the recipe. This dish was so heavenly that our entire conversation over dinner was about how wonderful the chicken was. I now envision this sauce on fish, on pork tenderloin, even suggested we make a lot and eat it as soup! I am very excited about this recipe. I believe the best way to cook is with an iron skillet, and although I steer away from it myself, my favorite Mom dish is fried chicken. I grew up with a lady that had no qualms about cutting up a whole fryer, and making us all so happy. I’m also a gravy lover. I know, some people call it “sauce”, but whatever…. Thank you for posting this recipe, and giving me a little inspiration and the umph it’s going to take me to do it. My closets are probably the most pristine rooms in our home. For some reason, I’m a bit OCD about putting things away. I’m happy to leave the house a mess, but the shoes must line up! As for the chicken, this definitely looks like a heavy rotation recipe. Simple, but flavorful. I love the idea of roasting the potatoes along side. My immediate though is always rice, but potatoes sound so good here! @Amy and other KOSHER cooks and NON-DAIRY seekers. Try Mocha Mix!!! It’s a non-dairy creamer and I use it in a lot of dishes. They also make a delicious ice-cream substitute for dessert with this dish. As you probably know soy milk and others usually have WHEY which is a dairy derivative so isn’t kosher. But Mocha Mix is the perfect answer. @Smitten Kitchen – I’m scared of iron skillets! I’m not sure why, I think cause I just didn’t grow up with one, but I will definitely try out this recipe in some other form of pan and maybe one day make the jump! GREAT recipe, perfect use of good wholesome ingredients. The dijon sauce looks yummy in the chicken :) Thanks for sharing this recipe. Love this recipe. I’ve made a variation many times with red wine vinegar instead of cream. You need to reduce the amount of white wine a little too, but it’s delish! Surprisingly, the dijon mustard still makes it feel like a (somewhat) creamy sauce. Sounds wonderful — my mother used to make this with bone in pork chops rather than chicken and it is fantastic (you can skip the oven part with pork chops). Thanks for reminding me of it! By the way, about that chicken stock, don’t throw away the bones you’ve been eating off of either. Six hours of simmering will kill any germs. Then you can make stock with just two chickens. Wow, there is a TON of learning and sharing going on in these comments. I love it. I made this tonight using a 5 quart dutch oven, I just left the lid of when I roasted the chicken in the oven. It worked perfectly. Thanks for the great recipe! What a wonderful dinner idea! I love the flavor of roasted chicken and dijon together, and I know my husband and I would just LOVE this dish. Thank you for sharing it, Deb! Have a wonderful weekend with your family. I have made this recipe so many times, we love it! We buy our chickens from a family that raises them localling, so they are always whole, and I have found that I actually prefer cutting up my own chicken. You are right, the whole bird can be used and it is really an advantage to have all those parts that you never get to see if you only buy the breasts or drumsticks. Sounds wonderful. I love dijon. Am adding it to the list of dinners this week! Thanks for posting it. I love simple recipes, Georgian chicken Tabaka, for example. Something tells me this will be my favorite. I am so trying this tomorrow. That looks gorgeous – I wish I could find shallots in South Korea, though =( And taking apart a whole chicken! How very exciting that looks. I shall have to try it. Just wanted to let you know that I made your Strawberries and Dumplings dessert and it was fabbbbulous! I also blogged about it and linked to your page. Thanks for posting the best recipes ever! I’m am very into cutting up my own chickens for both reasons you mentioned — I love making homemade stock with bony parts, but also because my local farmer’s market sells better chicken than the supermarket and they sell them whole. I don’t drink white wine, so I like to keep a 4-pack of little glass bottles of Woodbridge by Mondavi for recipes like this or risotto. One bottle is the perfect size and then I don’t have to make wine-containing dishes every day for a week. I think I’ll try this recipe this weekend by ditching the heavy cream and thickening the sauce with a little softened butter mixed with flour. there are several brands of vegan/pareve soy and rice milk found in supermarkets. Westsoy is one brand but there are others. Look in the natural foods or boxed milk aisle. Be sure for this purpose you buy unsweetened. The other way to thicken a sauce without cream is to boil the heck out of a potato, parsnips, or celeriac (celery root), and then puree it. It becomes a delightful thickener for sauces and soups, and it has a silky, “creamy” mouth feel. Delicious! Made this for dinner with a chive risotto and it was a hit! That dijon sauce is OUT. OF. CONTROL! Holler! Thank you so much for a recipe that pleases the whole house (all two of us). My mother was a horrible cook, which is what probably led to my becoming a pastry chef; I learned to cook from self-preservation (tho I imagine I had the desire, as well). My earliest food memory was having dinner at a family friend’s house (someone who COULD cook) and she made dijon chicken. I was probably 4 years old and 48 years later, I can still recall my mouth delightedly waking up. I also remember proudly serving it as a special at a restaurant I worked at when I was in culinary school and a patron coming back to the kitchen, asking for the recipe. So glad to hear you’re a fan, as well! Love your blog. Thanks for all your great musings. This is a great recipe. The fresh chives were the perfect touch! I had my first lesson about the “productivity” of a chicken when I was 6. My grandma taught me how to disjoint a chicken and how many different dishes one can cook with a single bird and feed a whole bunch of people. It’s still useful nowadays :). I cut the breasts in half which gives two more pieces, as well as uniform pieces in size. The Murrays whole chickens at West Side market are the cheapest anywhere, (even Fairway) and taste like chicken should taste. Nothing but grass fed chicken. I love your blog. This really made my night. Wonderful recipes, wonderful pictures Deb. I truly understand that part I quoted because I, too, type away carefully on my keyboard as not to wake up the baby, or else he’d bug me to watch Pocoyo. Hahaha! I made this last night for a recovering vegetarian and I thought she was going to lick her plate. The sauce is indeed fantastic. olivewood — I do not think that brands matter though I bought this one based on reviews. It is mesh, so it doesn’t trap moisture. It keeps the stove cleaner and I don’t get sprayed with hot fat (especially because I’m usually cooking in a tank top and OW). Thank you for interesting recipe! This is the definition of synergy. The chicken or the sauce alone are good but not extraordinary. But when they come together, the magic happens. This looks amazing! Roast chicken is a Sunday dinner tradition at my house, and I am so pumped to try out this new version. I do have a question though, you call for low-sodium chicken broth. When I make my chicken broth at home, I don’t add much salt to it, so does that count as low sodium? I am loath to go out and purchase the broth from the store if I have some in my freezer, ready and waiting. Congratulations on tackling cutting up a whole chicken! I started doing that myself 6 months to a year ago. It will get MUCH easier as you do it more and get more comfortable and you will feel less and less like you’re wrestling with a slimy, wiggly hunk of raw meat (or rather, you will feel more and more in command of that slimy wiggly hunk of raw meat). As at least one other person said, a good pair of kitchen shears makes a HUGE difference. I got a great not-very-expensive pair at Sur La Table a few years ago. “backs and etceteras”! Yes! Funny to spell AND delicious! Last night I was so happy to see I had all the ingredients for this in the fridge! I only had boneless skinless chicken breasts, but it turns out that they worked just fine. Delicious. That dish looks amazing! I am going to have to try it! Deb, I made this for my husband tonight and it was wonderful! Thanks so much for inspiring us! And to the folks looking for dairy alternatives, I’ve been tempted for a while now to try to make cashew cream and this dish made it happen. Really, it’s cashews soaked in water overnight, then rinse, add some cold water and blitz them in a blender. It just couldn’t be easier! No one would have ever guessed there was no dairy–just like the real thing. Absolutely divine! Thanks again, Deb. Thanks for the Ian Knauer video – that’s the best explanation of that process that I’ve seen. With that and your recipe, I think I’m going shopping for a nice, plump whole chicken. I’ve also started butchering my own whole chickens. One day in the store I looked at the cost of two chicken breasts which was 5 dollars. Right along side of it was a whole roaster chicken for 6 dollars. I made the decision that day to learn how to butcher my own chickens. That poor first chicken did not turn out so pretty, but now 3 months into taking my own chickens apart, I find that it’s not only more economical, but it also makes me feel different about cooking it – gives me more of a sense of not wasting anything. Another reason I started taking apart my own chickens was so that I could make my own broth. I started reading about how good homemade chicken broth can be for you and also how most chicken bouillon and chicken broths you can buy at the store have MSG in one form or another. I have a little two year old girl and want to feed her the healthiest food possible. I can’t wait to try this recipe, I love mustard and you have my mouth watering. I’m glad I found your blog, great job and I can’t wait to continue reading more of your posts and recipes. Funny, I’ve been thinking of parting out whole chickens, also. I’ll have to give the video a look-sie. I looked at this post this morning and thought about the recipe all day! OF COURSE, I raced home from work and made this chicken. “The sauce…” oh yeah, “I found it so difficult to not pour over the entire plate.” Oh wait, I DID pour it over my entire plate. Yum-meee! And silly me didn’t have any chives. Who needs ’em when the deliciousness of dijon, cream, shallot and roasted chicken fond comes together! Everyone! Stop talking and start cooking! This! This! This! I’ve been cooking a version of this for (cough) twenty years, since my husband and I were first married — I was a child bride, actually. Anyway, back in those early days I somehow got a copy of “French Cuisine en Famille” by Jacques Burdick, a now out-of-print and totally amazing cookbook full of French bistro and family-style classics. It’s uncompromising but dependable, like a French Marcella Hazan. And this is one of the dishes in it, though he recommends a half dozen or so peeled, halved garlic cloves, a bunch of sliced button mushrooms, and some onion wedges to cook with the chicken parts — I highly recommend those additions. For those inquiring about white wine ++ Try a pinot grigio. It is a dry white. A nice but expensive one for drinking is “Santa Margherita” usually in the $20 range (I live in the Southwest — can’t speak to knowing prices in NYC). But there are always many other pinot grigios that can be found for under $10. Also also… thanks Deb for the link to the chicken disassembly. Have been meaning to learn this for all the same reasons you stated. Chicken stock — I’ve always followed one by Martha Stewart. It is similar to the recipe Deb links to, though I have not tried the SK iteration (I am sure it is equally as lovely). Isn’t it amazing what you find when you start cleaning things out? I usually end up getting distracted instead of finishing the job. I don’t cook meat, but my X does and he has started buying whole chickens and doing the butchering. I convinced him that it’s much better to buy a bird from a farmer who he knows and use the whole thing instead of buying hormone laced chicken breasts. I made this last night, but used boneless skinless chicken thighs. I browned them a bit more carefully, since they didn’t have skin. It was still excellent! 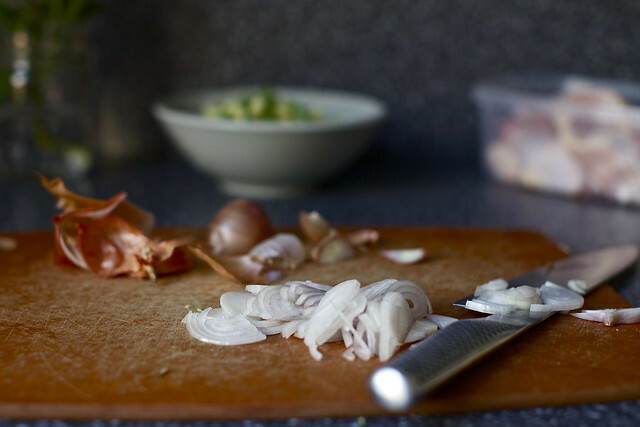 Why don’t the shallots get cooked a bit before adding the stock and wine? I may try that next time. For years I taught my classes how to cut up a whole chicken. Your post has reminded me of how beneficial it is to know this skill. There is nothing more economical than a whole chicken. Must try this recipe, also! So I made this recipe last night (using heavy cream, not the buttermilk as I had asked about earlier), and we thirded the recipe because it is just my sweetie and me. Wow. So so so so so GOOD! I want to make it again and this time get the full 3 lbs of chicken so we can have roast dijon chicken for days! Btw, I forgot to mention that I used some champagne for the dry white wine and it turned out awesome! This sauce looks delicious! Can’t wait to try it. OMG!!! Just made this chicken. I had thick bacon which I cooked up in the microwave and sprinkled bacon bits in the sauce. I also added some fresh thyme leaves. I served with roasted asparagus with olive oil, salt and pepper. Loved it! I used creme fraiche instead of heavy cream (because that is what was in my fridge) and leftover sparkling wine. The creme fraiche gave a slight tang to the sauce. The chicken was so moist and flavorful. This one is a keeper. Thanks so much for the recipe–I made it last night, and it was good. I’m pretty much in love with the sauce, which is a good thing since it seemed to take some time to get it done. I used heavy whipping cream with a little butter instead of the heavier cream because it was cheaper. I don’t know if it’s a good substitute since I never made it the other way, but we all thought it was very tasty. Other than that, I followed the directions almost exactly. This will certainly become part of my repertoire (which is way too fancy of a word given my limited skills and collection of recipes). Thanks again. So…first time commentator, moderately long time reader. I wanted to post for all those looking for cream subs. It’s not so much I mind the amount of cream in this sauce alone, it’s that at the grocery store the only cream they had was $4.50, and I already had yogurt (greek, fat free, no less) at home. I actually mixed the yogurt with about a tablespoon of flour (which was too much, but I think about half that amount would give the texture I was looking for) I definitely got a little curdling, but putting it through a sieve got rid of that problem. I even then added the shallots back in, once they were clear of the curds and it worked like a charm. (I really like the texture of the shallots) A little more work than just adding in the cream, but worth it if people really want to use a sub. The only other change I made was to add about 1/2 t honey after adding the mustard and chives, just to slightly cut the edge on the mustard. I also changed the cooking in that I browned the chicken in one pan, and started potatoes in another oven proof pan, and then transferred the chicken to sit on top of the potatoes. That way I got chicken flavor in my sauce, but got to roast the potatoes with the chicken. I served with a side of green beans, poured the sauce over everything, and it was heaven. This looks very appetizing but unfortunately I do not like mustard. Do you think I can substitute? Just made this for Sunday dinner. The family LOVED it and raved about the sauce. I didn’t have any heavy cream, so I substituted fat-free half and half. It did give it a creamy flavor, and the sauce was delicious, but perhaps not as creamy and thick as if I were using heavy cream. I served it with glazed sweet carrots, which was a wonderful contrast with the tangy sauce. A couple of folks asked about boneless, skinless chicken breasts (cheating, I know, but a whole chicken is sometimes more than this chica can handle with not-so-great knives). I essentially used the directions Deb gave. Salted and peppered both sides of four chicken breasts. Browned them in a hot, oiled cast iron skillet for about 5 minutes. Then, put in the oven at 450 for 15-20 minutes. Took them out and made the sauce as directed. Yummy. Yummy. Yummy. Just made this for dinner, delicious!! Thank you for the link on breaking down the chicken, so helpful. I remember first making a version of this with my mom when I was a kid, after which dijon chicken became somewhat of a house staple. I saw your take and had to try it – just about everything I’ve made from your blog has been fantastic – so thanks for another great recipe! The sauce really is fabulous, and next time (when I don’t just have chicken pieces) I’ll probably try cutting up a whole chicken, too. I’ve been obsessing about this since you posted it- made it tonight to major kudos from family- definitely a company-worthy dish, where all you have to do is refrain from spilling the beans about how easy it all is- I steamed my fingerlings and green beans since I was determined to make it as described and we were all delighted! Made this tonight and impressed the pants off my husband!! YEAH!!! Thanks for sharing this one – it’s going to become a staple around here! This looks too yummy!!! Have to make this soon! OK first, glad I’m not the only one who gets side tracked when “cleaning”. Second I can’t butcher for multiple reasons. Third, recipe looks great providing the butcher butchers for me. Just wondering, have you ever published a 10 favourite recipes? Or, top 20 must haves? I noticed you’ve said this chicken dish has become a favourite in your household and I was wondering if you have any other unforgettable go-to favourites? Thanks for all the great posting! I look forward to reading your new entries every weekend! Your Apple Cake recipe rocks! I made this recipe this weekend, and it was delicious! The chicken was so tender and juicy, and I almost drank that sauce out of a glass :) Thank you so much for sharing it. I can’t wait to serve it at my next dinner party! Yet again you have shared an absolutely delicious looking recipe with us and I intend to give it a try. Chicken is something that I cook regularly so it is nice to have different ideas. Excellent point about learning to cut a whole chicken, I currently leave this up to my boyfriend but I would love to learn how to do it myself! Will be trying your recipe out tonight! Hi Deb! So, if you want any other guide to taking a chicken apart, you should check out Alton Brown’s “Fry Hard,” where he talks about frying chicken. He does a tutorial at the beginning that made taking a chicken apart a lot less intimidating for me! Seriously, this was delicious. I (sort of kiddingly) asked my kids if I should make it again the next night and they were all for it. I could have doubled the sauce, as we sauced our roasted potatoes and steamed broccoli as well. I didn’t use a whole, cut-up chicken, but rather 3 lbs. worth of thighs and breasts, had the butcher cut the breats into smaller portions so they would cook evenly. Wished I had the splatter screen though! Thank you for this recipe! I made it last night and was even brave enough to cut up my first chicken using the video you suggested from Gourmet. I think I shall invest in a boning knife soon enough, but I made it through ok. You are right about the sauce – I wanted to pour it over everything, and then jump in and do some laps. Divine. I just made this tonight with a few substitutions (dry sherry instead of white wine, half & half instead of heavy cream, and no shallots or scallions) because I didn’t have everything as listed above and it still turned out absolutely delicious! I will be making it the correct way soon but the alternate was fantastic! 3. Cooked the chicken in a dish in the oven and at the same time made the sauce back in the original pan–probably didn’t have as much chicken juice in the sauce but still tasted lush and lovely. I’m sure the original is even better, but I will say this was absolutely divine, my 9 and 12 year old kids loved it, and it was super easy. Making it again for sure! This was the best chicken I ever made! The technique of brown on top of the stove and then roasting in the oven is what makes it the chicken so moist and tender and is a good way method to master. I did add some smashed garlic cloves and sprigs of thyme to the pan when it went into the oven. And I did cook it for about a half an hour turning it once it was still moist but with know trace of pink (I can’t eat pink chicken). I did saute the shallots in the fat in the pan before adding the broth. My husband and I thought the sauce was great, but the teenage boys opted for barbecue sauce. Yuck! Even though I have always cooked from scratch for my kids, when they hit the teenage years they seemed to get this taste for packaged food. Their loss! Deb, this chicken looks amazing! I spent a good portion of last night trying to convince my husband that we should try it but alas, he is enemies with Dijon Mustard. Do you think it is worth even trying with yellow mustard or is that just going to fail miserably? I made this with chicken legs because neither my husband or I like white meat and there are just the 2 of us. It was the best chicken recipe I’ve made in my 55 years of married life. The chicken was moist and so flavorfull. The sauce was devine. My only problem was that when I put it in the oven the splatter was unbelievable. I love your blog. I am constantly finding new recipes to keep our dining experiences exciting. This was so delicious. We all loved it. And, it was very easy, too! Thanks!! oh Deb. This recipe killed us. It was so good we were just spooning the sauce into our mouths… We’ve been reading this site forever and your recipes have never failed us. Thank you. (and our little 16 month butterball loves them all too). I even have a picture of my husband licking the spoon full of dijon sauce. Amazing. I made this on Saturday night for some girlfriends. I used a $7 bottle of Pinot Gris and it was delicious. And I’m a no-dairy gal myself so I had to be creative. I used coconut creamer that I had on hand. The flavor was right, but it curdled. Any ideas on how to prevent curdling? I made this dish tonight with wild mushroom risotto on the side and it was delicious! I almost missed this in my feed. That would have been horrendous because I love the mustard/chicken combo. Will DEFINITELY be trying this. Made this last night with some mashed potatoes while being blizzarded in. It was so good! I’m not usually a fan of mustard flavored things, but I even used the sauce on the potatoes instead of gravy. It was a perfect meal to accompany the “thundersnow” we had here in Chicago! Thunder, lightning, wind, snow, mashed potatoes and roast chicken with dijon sauce! Thanks again for the great recipe! For people asking about using regular milk instead of heavy cream, I just wanted to pipe up and say I tried it. I used homogenized milk (3.25%) and I found the sauce too thin, so I took out a bit of the cooking liquid out and stirred in a spoonful of flour, then returned it to the pot and whisked it in. Result: wonderful!! Still tasted delicious, and the sauce had a nice consistency. Hi Deb- Just wanted to pop back in here with an update. I was one of the “will this work with boneless skinless chicken breasts” people. I ended up cutting the breasts into small chunks, and coated them with flour, salt and pepper. I browned the chunks in a skillet and after transfering the chicken to a bowl to rest, I followed the remainder of the recipe as-is. Served the chicken and sauce alongside some mashed Yukons and crusty bread. I did boil the sauce to thicken it up. Might be nice with a little thyme, too. I’ll definitely try this again with bone-in chicken parts. Thanks so much. PS- I make the sweet and salty nuts you posted in Dec 08 at least once a month. SO good and so addicting. Cheers! I have a feeling you could easily do this recipe leaving the chicken whole – but cutting out the backbone with sharp kitchen shears and then turning it over and pushing on the other side so that it lies flat (you’ll hear the bones crunch a little). Then just get a sear on the skin, turn it over being careful not to break the skin and put it in the oven. Of course then you’d have to deal with cutting into pieces after it’s cooked. The upside is that it only takes 45min – and hour to cook or until a meat thermometer reaches 165. I learned the trick from Lucinda Scala Quinn using this recipe: http://www.marthastewart.com/recipe/flat-roast-chicken (this also makes an amazing pan sauce). At first I though you were making something with Jiffy Pop. I was confused. Now I know it is a spatter screen and everything is OK.
i made this last weekend for my family and everyone raved! so delicious. i did not find the sauce fierce or bright, perhaps i used a different dijon? just silky, savory and dreamy. thank you deb for keeping gourmet alive and kicking! I made the chicken today. It’s delicious! My 4 year old is munching on it right now and enjoying every bit. Thanks again! I made this tonight while snowed in here in New Mexico… I did not use shallots or chives as my honey is allergic to onions, but it came out great! Thanks Deb – another fabulous recipe. I made this tonight without the wine and I used fat free sour cream instead of heavy cream. It came out delicious! I did experience some curdling but it became a non-issue once I whisked in the mustard. I also used three boneless, skinless chicken breasts (darn diet) which I know are a poor substitute for thigh bone-in meat, but it still was delicious. The only change other change I made was reducing the oven cooking time to about 13-15 mins due to the smaller amount of meat I used. this was amazingly wonderful and the taste is unbelievable–thank you for the recipe! Yum, I love mustard with chicken, I must try this. I also think a send-baby-to-grandma’s so I can clean out closets is in order. There really is no other way for it to get done! Since I don’t currently own an oven safe skillet, and prefer boneless skinless breasts, I coated my chicken in seasoned flour and cooked it off completely on the stovetop. I then followed the instructions for the sauce exactly. It was breathtaking and I will be making this again and again and again.Add sauteed green beens, garlic mashed potatoes and some white wine = a perfect winter meal. My first comment after I was introduced to your website a week ago, and this is the sixth recipe I’ve cooked already! I think we can safely say I’m addicted, so thank you! This is a great recipe – I used a quarter of a white onion instead of shallots and skipped the chives as I didn’t have any and it looked perfect. Then just after adding the juices from resting the chicken, I dropped the skillet and lost half the sauce overboard – I could have cried! It still tasted good though! I recently realized that I had been throwing away a choice little niblet on the chicken when I butchered it. *Just in case* you didn’t know this already, it’s the “chicken oyster”. Linda — Ha! Ian mentions that in the video I linked to. He says it’s his favorite part. Ok, just made it. Similar to what KentishSarah tried. I only had chicken legs, but they turned out great. I returned the chicken to the pan just before serving, and the sauciness was perfection. Served it with roasted potatoes and a salad with vinaigrette….I think this simple work of art will be in high rotation in our kitchen. I made this tonight and it was so delicious! Thanks for sharing your recipes. I’ve been getting over my fear of the kitchen and it’s great to find stp-by-step stuff like yours! So delicious! Thanks for your great recipes. Can’t wait for your cookbook! Deb- Thanks so much for the advice on the splatter screen- I just ordered it! I noticed how clean your stovetop was- Hopefully this will help mine be cleaner? Hands down, a new staple. Had to improvise with half and half, chicken breast and a little regular onion, but it was great. Put the chicken and some broccoli over a bed of brown rice, drizzled the sauce over and my kids ate it up. My 4 year old asked if we had left overs as I was tucking him into bed just a minute ago. That has NEVER happened. Well done! i just wanted to add that i LOVE that french bistro issue of gourmet magazine. i’ve made many of the recipes in it, and each one is better than the next! Made this, tripled the recipe and it was a huge hit, will most definitely be making this again. Thank you! @Linda – Nooo! All those lost oysters … when we have roast chicken, my husband & I start hacking it apart but go straight for the oysters and tail piece first. They’re like our chicken appetizer! As for this chicken – another amazing winner Deb! We got bone-in chicken breasts from our local butcher & the browning-then-roasting method made them the most succulent, juicy, tender chicken breasts I’ve ever had. And we looove our dark meat. I lacked several of the ingredients but managed to throw together a lighter version of the sauce with dijon & reduced broth – it was just enough delicious tang for the chicken and spoon over the asparagus & orzo. Wonderful dinner! I’ve been making a similar sauce with pork chops for some time –which is even easier and faster than chicken as the chps cook quickly on the stovetop. The mustard cream sauce is so delicious that I have to keep myself from licking the sauce off the plate. This was really yummy! I cheated a little and used boneless chicken breasts instead (that’s what I had in the freezer!). I cut them into thin cutlets, breaded them in a little flour, and cooked them on the top of the stove. Then I removed them and continued with the recipe for the sauce as normal. I put the chicken back into the sauce and let it simmer just a little while. Very tasty! That video changed my life! I took apart my first whole chicken yesterday night and felt like I conquered the world. My cutting board ended up a tiny bit messier than Ian’s, mind you, but the butchering was not bad for a first timer. I’ve been wanting to try it for ages, so thank you! This was fantastic. Really a tasty dijon sauce. I did only one thing differently from the recipe – I marinated the cut up chicken pieces overnight in buttermilk. I think that helps promote juciness and flavor. Oh, and I also lightly floured the chicken pieces before searing. When I make this again I will double the sauce. I reduced it to make it thicken and we really would have liked to have more sauce. Yum! I made this a couple of days ago…it’s fabulous! I get to take the last piece for my lunch today. I’ll definitely be making it again soon! Is it assumed that I should drain some of the fat either before putting the skillet in the oven or before making/reducing the sauce on the stove? Made this tonight and it was absolutely fabulous, except for waaaayy too much oil in the sauce (which I think impaired its ability to reduce properly). Advice would be great – I’m not sure at what point to skim/drain off the oil and how much to remove. Thanks! P.S. Made this with the 1 TBSP of veg oil as listed, and 3 lbs chicken thighs (bone-in, skin on) – perhaps my thighs had lots of extra skin compared to a whole cut-up chicken? I haven’t had too much fat in the pan, but if I did, I would have probably drained it to a tablespoon or two. I made this the other night with drumsticks and some boneless skinless thigh meat, and it was great! Served with oven-roasted carrots (Cook’s Illustrated recipe, mmm) and roasted redskin potatoes. The man of the house likes to dunk all potatoes- gourmet delicate morsels and fries alike- in ketchup. But! The sauce from this chicken recipe proved to be the perfect upgrade, and kept Heinz in the fridge for the night- Delicious! Really I dont what is it, but chicken and dijon are like brothers! A.MAY.ZING. I made this tonight for my fiance, and it was an instant hit. I served it with fresh green beans (as suggested) and Texmati rice (with sauce drizzled over the top, of course), and WOW. This is definitely going in the recipe box for a repeat performance! Dishes with mustard sauces are my husband’s favorite. Lovely recipes thank you. Thank you! I convinced a friend to drive to my house (30 miles away) on the promise of dinner, so I new I needed to make something good. This chicken was incredible! I made a similar mistake as one of the above commenters and used beef stock instead of chicken stock. Followed dinner up with your best cocoa brownies. Even after trekking the 30 miles back home, my friend said the drive was worth it and I have convinced her to visit me again. Thanks for helping me keep up the appearance as a creative and amazing cook! Fabulous! Perfect chicken…loved the sauce! Planning a ‘Smitten Kitchen’ Valentine’s Day of sorts tomorrow with this chicken recipe and the Chocolate Soufflé Cupcakes from last year. Have to say a big THANK YOU, as well, for posting the Gourmet video on cutting up a whole chicken. I DID IT!!!! In a bowl with about 4 TBS of softened butter mix in ~1 clove minced garlic,~1 tsp dried thyme, ~2 tsp dijon and anything else you think you might like. Let sit for a bit to develop flavors. After browning skin, place approximately 1/2 tsp of flavoured butter under skin, and roast in oven til done. As you can see, very similar – thanks to Smittenkitchen, now I’m thinkin’ that with a few tweaks (and maybe a little fat removal) I don’t have to toss the pan drippings the way I’ve reluctantly done up until now. .
As has been noted above, searing meat does not “seal in the juices”. The above commenter mentions Harold McGee’s “On Food and Cooking”, which I totally endorse. I’d just like to add a bit of what McGee says on this issue. Specifically, not only does searing not seal in the juices, it actually dries out the meat. This makes sense because when you’re searing something you hear all those sizzling sounds. That, amongst other things, is the sound of water coming out of the meat and being boiled as it hits the surface of the pan. This is one of many reasons that brining is so important for certain preparations because it will help to combat the drying out inherit in searing. However, the browning of the meat makes it so much more flavorful that we end up salivating more when eating the meat and thusly the meat appears to be more juicy than it is. made this recipe last night and it became an instant favorite. i had the butcher cut up a whole chicken for us instead of doing it myself. this recipe is easy enough to make after work but i will also be using it as an entertaining dish because the flavors are just so damn good! thank you for this little gem. My husband made this for dinner last night, and it was so great! Immediate addition to the recipe binder! We used a pre-butchered chicken and froze half of it so that we will have the pieces ready for next time, because, yes, there will be a next time. I am sure my hubby would love this! Gonna try it sometime soon! Very, very good :) I have extra sauce so I plan on making something that can be covered in it tomorrow night! Made this tonight and it was GOOOOD. Didn’t have heavy cream so used reduced fat sour cream and it was very good – i’m sure the heavy cream would be awesome. Hey, I know I’m late to the party (I often am), but just wanted to report that I made this chicken tonight and it was a hit. That’s saying something too, as I was serving it to 5 children. Four of them loved it That’s a good percentage in my book. Thanks, Deb. I tried this recipe out on my boyfriend the other night and he couldnt stop complimenting it. I added a little flour to thicken the sauce and found myself spooning out the remaining sauce to eat by itself afterward.. Delicious! Thanks so much! How do you think it would turn out without the cream? It looks amazing, but we’re kosher and don’t mix dairy w/meat. Made this for second time and once again soaked it overnight in buttermilk then prepared as directed with one substitution this time. I added goat cheese instead of cream. I have on hand some goat cheese that is very mild, almost like cream cheese really – it’s made by Pampered Goat – so I tried that. It was very good. Served it with roasted sweet potatoes. I made this last night for some friends. It was very good and I really enjoyed cooking the chicken and making the sauce. I served it with roasted potatoes, roasted asparagus and brussel sprouts with honey and panchetta. It was a big hit and lucky me. . .I have leftovers for tonight! I made this last night with your sauteed zucchini & almonds and pan-fried potatoes and onions…it was so good! My DH said that this was the first time he liked chicken that wasn’t barbecued…and then four pieces later, he poured some of the sauce on his plate just to have it with some leftover baguette! As someone else mentioned, I’ll definitely need a splatter guard when I make this again…I had to use the lid for the pan as a shield against the hot oil! I can’t wait to eat the leftovers tonight! I don’t think I get it. Ah, I’ve read that but am still not convinced from practice that it’s untrue. Nevertheless, searing leaves a lovely texture on the skin and keep the skin on always keeps the cooked meat more moist, even if you ditch the skin later. Oh, and I’m only surprised because you usually know everything. And I have now seen this was already talked to death above. So, sorry. this is so freaking delicious, i could just die. or i could just make it again. that sounds better. thank you!! p.s. this is a great recipe for bringing to new moms or to a dinner party. simple and a real crowd pleaser. i serve with sauteed mushrooms and wild rice, and everyone shouts with joy. I bookmarked this way back when, and made it tonight. Pretty much changed our lives. My husband is SO HAPPY. Delicious, thank you! I tried to scan the 300+ comments to see if this was already addressed, but … How would you make this for a crowd? As in, more than one chicken? I love using my cast iron skillet for this recipe as written, but it’s not big enough for company. I have an enameled cast iron Dutch oven, but maybe a glass casserole would work better (to spread out the pieces)? Any thoughts? You could probably brown all of the pieces and bake them in a larger baking dish. My daughter wanted chicken alfredo penne for dinner tonight. I wanted roasted chicken breast (which had already been defrosted). I doubled the sauce recipe and made the rest as is and sliced the chicken off the bone and added to the sauce and pasta. WINNER! Wow.. This looks so awesome!! This just moved to the top of my try-this-asap list.. Thanks.. I made this last night and it was wonderful. The only change that I made was I used mascarpone cheese instead of heavy cream. I realized while cooking that my heavy cream was bad (unopened and three weeks before the expiration date, ugh!) and it was the only thing I could think of in my fridge to substitute but it worked out perfectly. Thank you for posting this recipe! I had some friends over my brand-new house for my birthday and I wanted to make them an elegant, dinner party-worthy meal, and this dish perfectly fit the bill. I was doubly excited for the first chance to use my cast iron skillet! The sauce was great as directed in this recipe, but I have to say that when I tasted it with everything but the mustard it was great as well, so next time I might decrease the mustard by half or just omit it entirely. I also added a few chicken breasts to my whole cut-up chicken so that everyone would have enough and I should’ve given those a shorter cooking time … the bone-in pieces were perfect but the boneless breasts were a bit dry. My fault for leaving them in the pan so long. The chicken was delicious with mashed potatoes, broccoli, and homemade dinner rolls with garlic herb butter. I bought another whole cut-up chicken and didn’t need it, so I’ll definitely use it for this recipe again. Thanks! So glad I stumbled upon this. I was just thinking yesterday that I need to learn to butcher my own chickens, since as you said, the local ones are sold whole. It always seemed a little daunting, but I think you convinced me I can do it. I’m going to try this recipe too, although my husband doesn’t like Dijon. Maybe I’ll start with a tiny bit. This has become my family’s favourite chicken recipe as well. And now I’m inspired by the brussel sprout recipe too! made this chicken when i went home for fall break (i’m in college). after taking the skillet out of the oven and setting it on the stove, i grabbed the handle on accident and ended up with bad second degree burns on the entire surface of my right hand. my mom called the doctor, they said to go to urgent care since hands are so important. before taking me, my family sat down and ate this chicken. and i, with my blistering hand submerged in iced water, also sat down and quite enjoyed it. this is a true story about the deliciousness of this chicken. oh, and don’t grab the handle of a skillet fresh out of a 450 degree oven. …p.s. my hand is fine. …p.s.s.s. even if i wrote with my right hand, i think my family still would have enjoyed the meal before taking me to the er. …p.s.s.s.s. the day afterwards, with only one usable hand, and the other bandaged and throbbing, i made the chocolate sour cream coffee cake. so. worth. it. Hello! First time commenting here. I made this tonight, and while it tasted delicious, I had serious issues with the pan smoking in the oven. I got so nervous (and tired of fanning the alarms) that I finally gave up and transferred the meat from the cast-iron skillet to a baking pan to finish it off at 400 while I made the sauce. No one else seems to have had this issue. I do think my hand slipped a bit when first pouring in the oil (more like 2 tbsp in there), and I used just 2 pounds of chicken legs….could too much exposed oil in the pan have caused the smoking? Any thoughts most welcome, as my family did love it. Thanks! My boyfriend and I made this together for dinner earlier, and it was absolutely amazing. Can’t wait to try the Thai chicken! Would this be good with the dijon brussel sprouts? Or would that be too much dijon? Trying to make a special meal :) Thanks! Oh my goodness! I made this for dinner this evening for the first time, and it was sooo good. And to Alison (comment 339), I don’t know about going the whole extra step to do the dijon Brussels sprouts, but I spooned the sauce over steamed broccoli, and it was heavenly. You’d think I’d have learned from your experience… But alas, I had this recipe bookmarked from the day you posted it, and yet neglected to make it until tonight… This chicken is unbelievable. Amazing. The sauce – I could have eaten it by the spoonful. When my husband took the platter away with the remnants of the sauce still on it, he almost lost his hand, so desperate was I to save every leftover drop! Thank you for sharing – best thing to happen to me all Monday! I also save leftover chicken backs, etc., for soup, and I strongly recommend tossing them in the oven to roast while the rest of the parts are roasting. I was astounded at the difference the first time I made stock with roasted leftover parts instead of raw! On another note, I’ve had good luck using a slurry of extra chicken broth with a little corn starch to substitue for cream in chicken sauces. I made this last night… with some variation on the sauce. The technique for cooking the chicken is spot-on – the chicken came out perfectly cooked, moist, and flavorful, with crispy skin. I’ll use this method over and over again, I’m sure. For the sauce, I didn’t have wine on hand, so I was planning to use all chicken stock, but then I got curious and decided to experiment…. I used 1/2 cup apple cider along with 1 cup stock. The cider gave the sauce an interesting flavor, but a little on the sweet side. If you want to try apple cider, I’d say go with 1/4 to 1/3 cup cup cider. I also used grainy dijon mustard because I prefer that, and it gave the sauce a strong mustardy flavor that went very well with the brown rice and green beans alongside the chicken. We tried this tonight since DH came back from the store with split quarters. Raiding the pantry we made the sauce with normal dijon, white wine vinegar and ready-whip (or whatever the brand is that uses real cream), it tastes amazing! I like the bits in it, adds character. Another winner. This tasted like a french bistro chicken – AMAZING. I left out the cream factor entirely; I thought about using some leftover cream fraishe or however you spell it (south park….) but I didn’t think the sauce needed it so I omitted it. Added worchestishire sauce and lots of lemon zest, lemon juice, thyme, lavender, and garlic. Had this with challa and mashed potatoes and salad. yum. I have been starting to eat more chicken lately. This was a simple, yet flavorful dish. I went with a Sicilian Cattarato with this…light for the cream, lean for the mustard. Heard your story on NPR and decided to check out your site, I am a former blogger, love to cook, surf and enjoy life, good job! Congrats! Gorgeous meal. I made it tonight. Followed the recipe. Love your website and everything I’ve made from here has been divine. Some things have become family staples (Shakshuka, for one). Will keep exploring Smitten Kitchen! delicious! thanks again for a delightful dinner. And that link on how to cut a whole chicken was extremely helpful, as i don’t like the way our poultry vendor butchers the bird. This was amazing! I am glad I have leftovers for tomorrow. I did however, have to do one substitution, which was the heavy cream for plain greek yogurt because I did not have any heavy cream, but it still turned out delicious! Thank you! My mom made this recipe (basically) almost every weekend for the family when I was growing up and it’s still that one recipe that I leave up to her to make – never tastes the same! SO good! I made this yesterday and loooved the sauce! Do you think the sauce would lose on its flavour if I replace wine with water? My ovenproof skillet will only go up to 400 deg. What’s magical about the 450 temperature? Hi Susie — Cooks faster, gets more crisp. 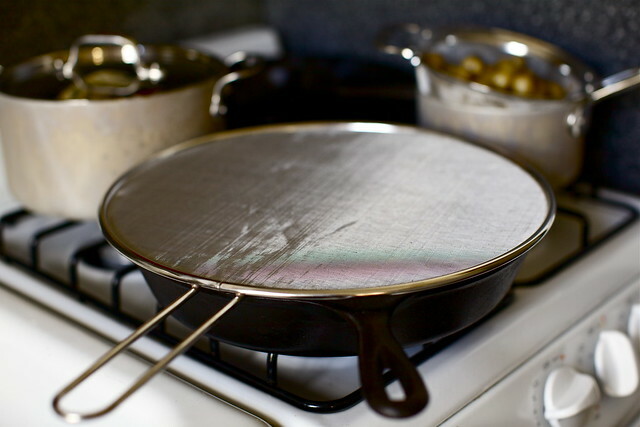 Just use the temperature that’s safer for your pan. The cooking time is just an estimate (due to ranges in chicken sizes/how cooked it got during the pan-browning step); you may need 5 minutes more. I just made this last night, and it was the star! I of course made a couple adjustments- onions instead of shallots and reduced fat sour cream instead of heavy cream. The chicken was cooked perfectly, even though I dutifully threw away most of the skin after roasting. The sauce was delicious, and I sopped up the rest that was left in the pan with roasted potatoes. I did get some smoking in the oven, which was likely due to the fat that dripped and splattered everywhere from the chicken thighs. But turning off the smoke alarm twice was still worth it! 1. Heavy cream; hello, this is 1/4 cup (4 Tbsp.) for four to six people. Not going to cause a heart attack. On its own; moderation is the key. 2. Second group of chicken stuck more than the first. No big deal: more yummie scrapings for final result. 3. The Sauce: OMG! Had one eater who isn’t a mustard fan but he was licking his plate. 4. Served with oven roasted potatoes and fresh spinach. Getting close to T’giving where we do green beans (as suggested by Deb) so wanted a change. Spinach was great for sopping up the sauce; can only imagine how good the beans would have been as they have a great affinity to mustard. A definite keeper! What to do with extra cream my one son asked, my response– add it to the decaf we’ve been forced to use and it won’t matter. This is one of my favorite chicken recipes ever. Takes a bit more time than just throwing a bird in the oven to roast, but dear lord it’s worth every minute. It’s such an ideal winter meal! Served it tonight with a riff on theroasted root veggie and quinoa salad from your cookbook. Thank you for making a cold and snowy Wednesday all the better! I made this for dinner last night and it was delicious! A new favourite in my house. I did put in less mustard, about a teaspoon, and it was perfect for us. I served it with steamed green beans and the leek confit recipe from Epicurious. Hi Deb! Super-excited to make this for my family (including my Mom and Dad!) on Wednesday night. Question…can I brown the chicken before they get here and then compile the rest and throw it in the oven while we hang out? Is after the browning a good place to stop so things are “ready-ish” and I’m not in the kitchen all night?! Thanks so much! Alyssa — I think that’s a good plan! Deb, I want to tell you: THANK YOU!!! for your consistent and consistently delicious postings. I have never been disappointed by any of your recipes, your commentary on them are both entertaining and educational, and you generously post ALL THE TIME!!! You haven’t become stingy with your insights and recipes in the wake of your success. I rushed out and purchased your cookbook as soon as it was available, and I promise to do the same with any and all materials you publish in the future. Thank you for your expertise in cooking and writing, for your humor and your loyalty to your readers. I have problems cooking with white wine. I’m mostly a red wine drinker and the whites I generally drink are too crisp and acidic to make good sauces. They turn out sour. I would think an oaky Chardonnay would be best. Can you tell me what varietals you’ve had good luck with? Riesling might be good too. I’m not seeing it in the recipe: do you add the Dijon with the wine? Holy cow. This was AMAZING. I made a little extra sauce, roasted some new potatoes and brussels sprouts on the side and served the extra sauce to pass, for those who wanted their veggies coated in the goodness. I also put the chicken under the broiler for a couple to really crisp the skin nicely. It’s a keepah!! So, this was the first time I’ve bought or used wine in cooking. (I used a pinot grigio because that was a suggestion from friends as a good all purpose dry white whine) My husband says that to him, the flavor is light and the sauce is tasty. I, however, sour/bitter/vinegar aftertaste. It looks like my supertaster tendencies are kicking in. Is there a better variety to try? Should I give up and just sub it out? Jaime — The Dijon is added at the very end. Amy — I’m not particular about varietals. I tend to buy dry, crisp wines, usually French, for drinking and would use the same in here. Jeri — It’s hard for me to say if you just don’t like wine in cooking or if you just didn’t like the wine you had. the sauce seems good yet I don’t know if I need it! Thanks for walking me through making some good roast though! I always default to the easy breast. Went ahead and bought the chick with the skin and the bones and the meat. got it nice and crisp in the pain before roasting! I’ll agree with previous poster Andrea – you, Deb, are generous and consistent and I’ve loved every recipe of yours I’ve followed. Of course I often change them a little, because I don’t always have the ingredients. I just made this, and it was amazing. Here’s what I did today – didn’t have bone in w/ skin thighs, though I concede that would have been better. Also didn’t have heavy cream so I used (1/2 of called for) half and half, and at the end added (1/2 called for) sour cream. I also added tarragon with the chives, and a ton of pepper. I made less of the sauce, because I had fewer thighs. In the future I’d make the full recipe of sauce, cause it is so good I’d have poured it over the asparagus I served with it. So so good, and very easy. I made the entire dinner while avoiding local news of storms whipping through Louisiana. I know a couple boneless-skinless variations have been posted here, but I just made a successful version with boneless-skinless breasts that came out moist, with a brown, crackly, flavorful crust. I think the trick is to skip the roasting. As you would for the original recipe, I heated up a cast-iron skillet for several minutes over high heat, then heated a tablespoon or two of olive oil till it was nearly smoking. I added the well-seasoned breasts and let them cook on medium-high heat for five minutes on each side. This let them develop that essential crust. Meanwhile, in a separate saucepan, I heated two tablespoons of butter to make up for the fat that would be in bone-in, skin-on chicken. (I guess margarine would work also? Never used it.) Then I tossed in the shallots and let them soften a bit. From there I added the liquids, cream, and mustard, following the recipe exactly. When the sauce had thickened and reduced, I poured it over the chicken breasts and served. Quite delish—though Deb’s version will beat this one any day. Bon appetit, everyone. This continues to be one of my favorite go-to chicken dishes – I dial down the dijon a little to please our six year old, roast some asparagus in the same oven, salad + bread = perfect dinner. If I had one tip – it would be to salt the chicken in the morning to really season the bird well. This is the best chicken recipe I’ve ever made. Thank you! When you brown chicken or other meats in batches, what’s the proper way to store the chicken that’s already been browned? Do you cover it to keep it warm? I know there are food safety concerns with partially cooking meats and letting them linger too long parially cooked. Depends on how long you’re thinking — an hour or less, I’d just leave it out. A few hours? I’d re-chill it. Look like this commenter made it with coconut milk successfully. Comfort food at its finest. This was soooo yummy!! I cooked it all on the stovetop (confession time… my oven was smoking and I was too lazy to clean it). Browned the chicken pieces and then made the sauce in the same pan and added the chicken pieces back in, simmered covered for 15-20 minutes. Whole family loved it. Mine didn’t come out as crispy as it looks in your pictures… did I not brown them enough? Or I wonder if it would be better to cook at a lower temp in the oven longer? And for the sauce, do you leave the shallots in it when you serve with the chicken? It’s all about the browning in the first step for color and crisp. I don’t strain out the shallots but traditionally, they are. This looks great. How do you prepare it in advance so you’re not cooking when the company arrives? The pan sauce keeps but if it’s a small crowd and you don’t mind doing 5 minutes of last-minute cooking, you could also make it right as needed. You could, perhaps, brown the chicken earlier and then just put it in the oven when everyone is getting hungry for dinner so it’s freshest. A favourite of my family for years now. I made this and before I added the two tablespoons of dijon mustard, it was heavenly. After I added the mustard, there was such a bitter bite. Should the mustard taste be so strong? It changed the whole taste completely, sadly. This is easy and delicious. Everyone at the table loved it. I am so glad I made this. It was easy and tasty. I think next time I’ll add an herb to spruce up the sauce even more. What herb would you add, Deb? I was thinking bay leaf. I’m new to cooking. A dry white wine would be? what kind? I just made this after seeing your Instagram post this week. I know it’s been a while since the original blog post, but in case anyone’s still listening, here’s my two cents. To keep this dairy free, I used about a tablespoon of mayo instead of the cream. I thinned/tempered it with the hot broth from the pan to get it to a cream-like consistency, and then whisked it into the gravy. Granted, I’ve never tried it with cream so I have nothing really to compare it to, but my way turned out pretty darn delicious. Thanks for another keeper! Maybe you could also try tofutti if vegan? I’m cooking for one. How are the leftovers? I’ve made extra for work lunches and I find it makes good leftovers. I’d store the extra sauce separately from the chicken to prevent sogginess though. This was absolutely delicious. Served the chicken and sauce over chopped spinach with roasted tomatoes (we are trying to go the healthy route). Everyone wanted to lick their plate. This is a new favorite! Oh I’m excited to make this! It looks so good! Now I just have to find someone to make it for! This was fantastic! My husband wanted to drink the sauce and put it on everything possible. Followed the directions exactly, although I used 2 huge chicken breasts and cooked them in the oven for 25 minutes and then after the sauce was made, I put them back into the sauce to simmer for about 5 more minutes in the sauce while I was getting the rest of dinner ready. I would definitely make again. Thanks for the inspiration on Instagram to visit this recipe – it came at the right time just before I was heading to the grocery store to buy ingredients for dinner. It solved the “What’s for dinner” dilemma! I made this with inexpensive skin-on, bone-in chicken thighs. My family gave it a thumbs up and it was super-easy to make. Have now made this twice and it’s amazing. My one beef with pan sauce recipes is they never make enough sauce! This one gets that you actually want plenty to go on everything. I’ve made it once with white wine and once with vermouth and both times it was great.